Our last game was Monday, but the season truly ended this afternoon with a noon celebration of Bill Law's life here at the ballpark. The closing prayer was followed by Take Me Out to the Ball Game. Reception fare: hot dogs and nachos. That's the way Bill wanted it! 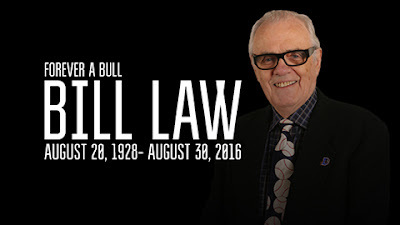 We will miss Mr. Law…deeply. I have not known a more loyal member of the staff. And I can still hear his voice at the ball yard. A moment of silence for Bill Law at the August 30th Bulls game.